Three missiles, two single rail launcher APU’s and Box. 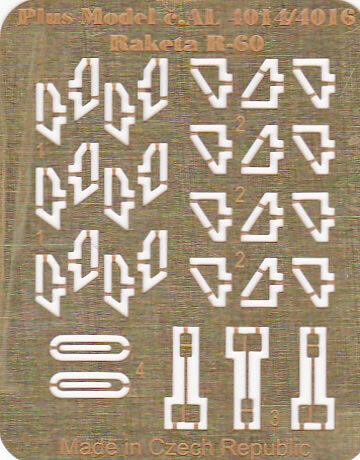 Set contains 19 resin parts, photo etched sheet, decals and A5 instructions. Four missiles and two double rail launcher APU’s. Set contains 18 resin parts, photo etched sheet, decals and A5 instructions. Three missiles, two single rail launcher APU’s and Box. Set contains 15 resin parts, photo etched sheet, decals and A5 instructions. Great detail in resin, photo etch, decals and a painting guide. Everything in one package. Well done AERO Line. Very highly recommended. 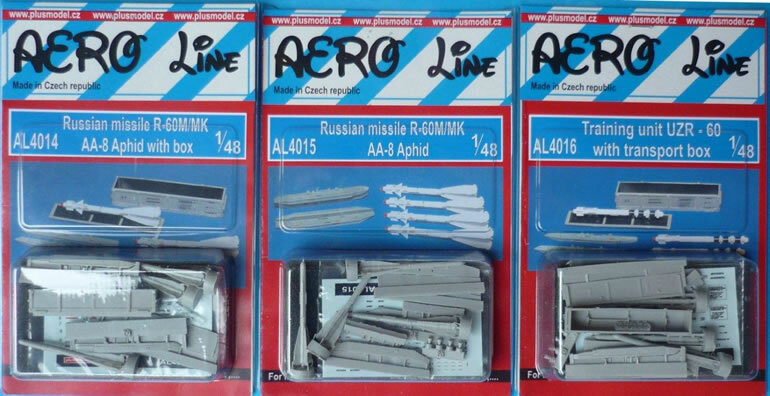 Don’t even think about using the kit supplied plastic weapons, get these from AERO Line to add that extra level of detail to your MiG or Su. 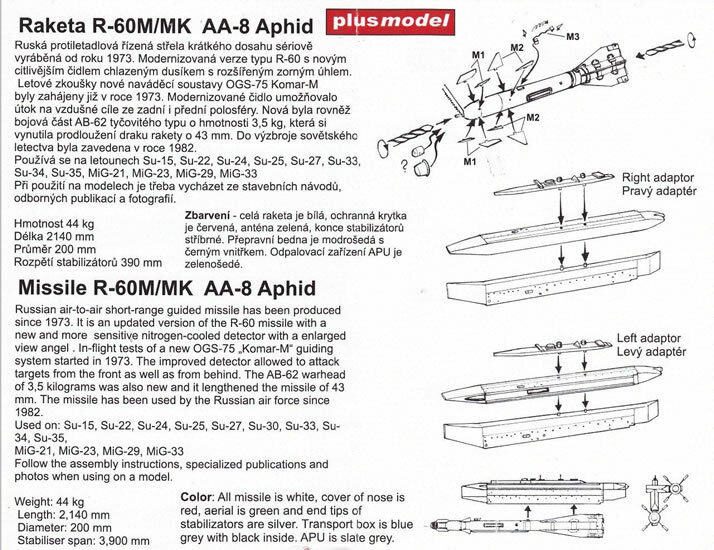 The R-60 (AA-8 'Aphid' is the NATO code) was developed as an Infra-Red homing missile in the late 1960s early 1970s. Missiles for export customers were known as R-60K. Two different types of proximity fuze can be fitted: the standard Strizh (Swift) optical fuse, which can be replaced with a Kolibri active radar fuse. Missiles equipped with the latter fuse were designated R-60K. 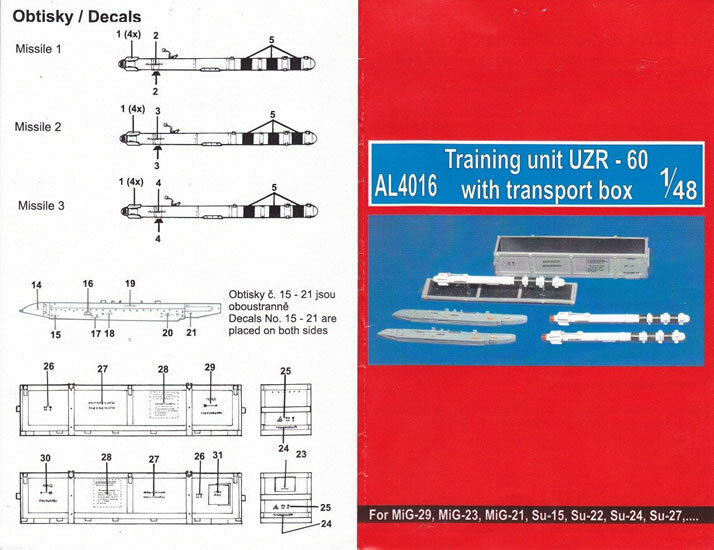 An inert training version, for the AA-8 Aphid-A was designated UZR-60. An improved version, the R-60M, was developed in the early 1980s. Export versions of this missile were known as the R-60MK or sometimes R-60TMK. An upgraded version (approx. 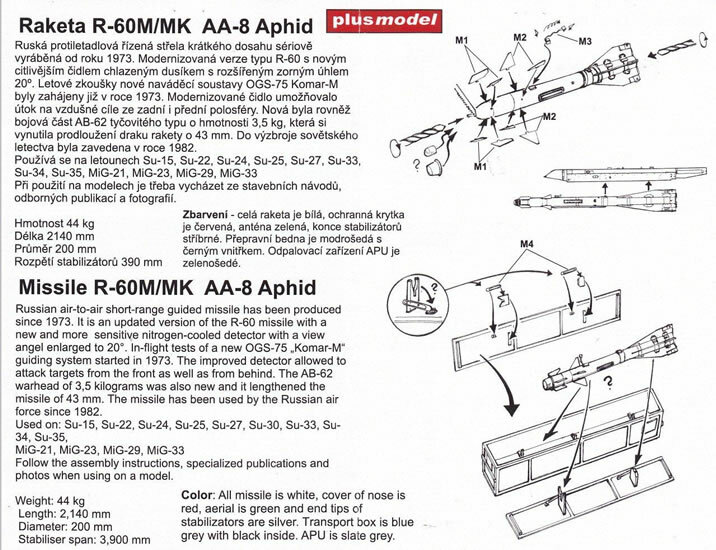 43 mm longer than the previous version), the R-60M (NATO 'Aphid-B'), using a nitrogen-cooled seeker, was introduced around 1982 (R-60Ms with the Kolibri-M fuze are designated R-60KM). 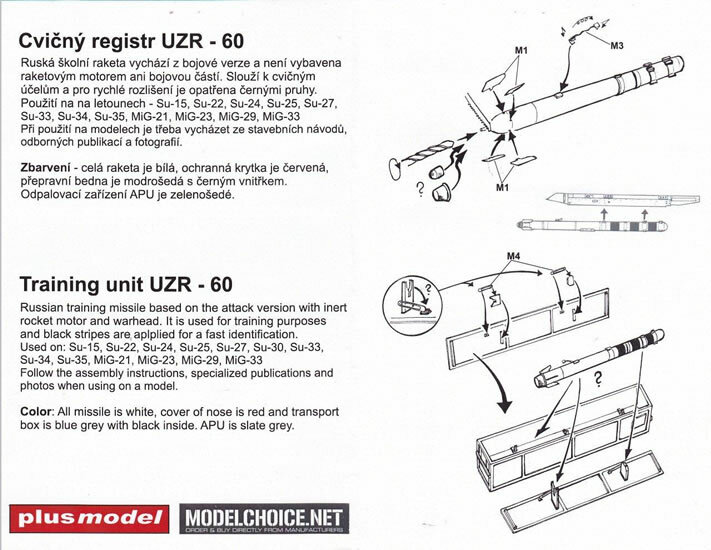 There is some confusion over the allocation of NATO codenames to the R-60 series. 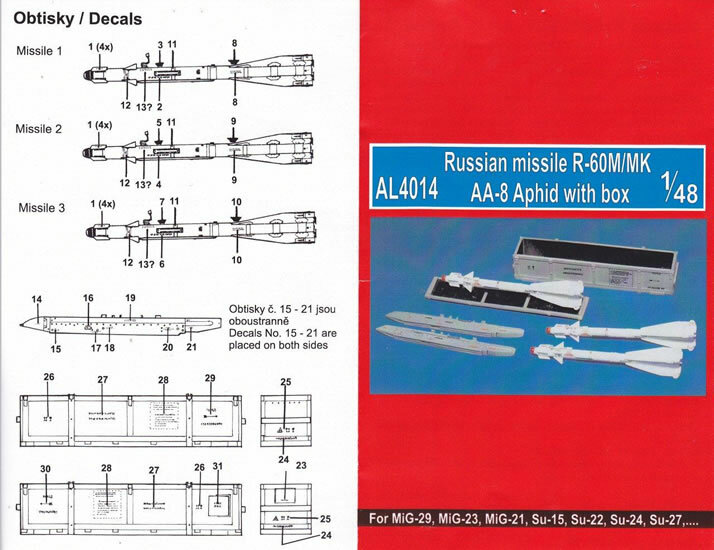 Some sources state that the basic R-60 missile (R-60T and R-60K) was known as the AA-8 'Aphid A', while the R-60M was the AA-8 'Aphid B' and the export R-60MK was the AA-8 'Aphid C'. I’m reviewing all “three as one” here due to their similarities. 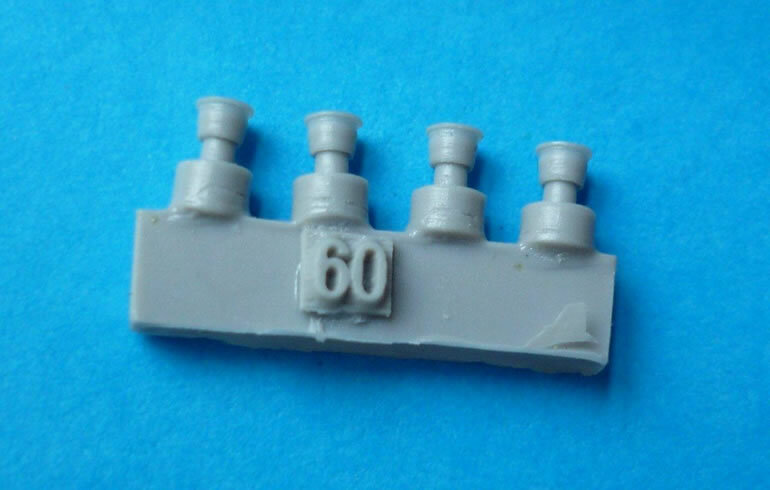 All the kits have very finely detailed resin which is beautifully cast. 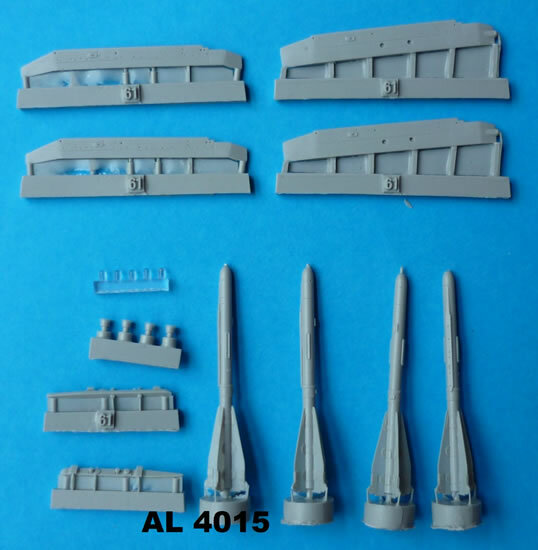 You will need to be careful removing the missiles from their block as the rear fins are very delicate however AERO Line have done everything to assist you by using very fine attachment points. What could not be done in resin, AERO Line have provided on a photo etch sheet, forward fins and various fine detail comes as PE. 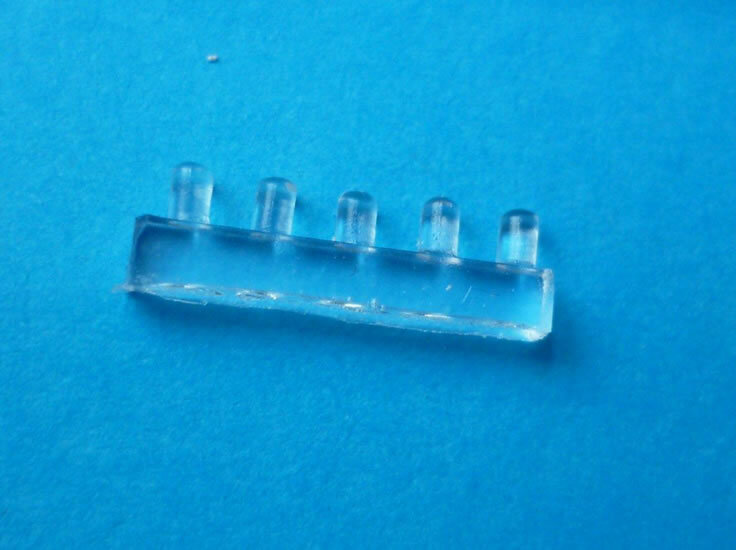 You get two options with the seeker heads, either with an environmental cover or with a clear resin piece to simulate the seeker itself. 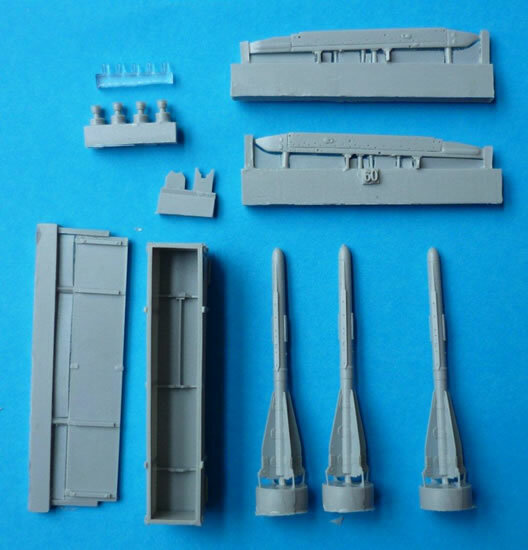 You will need to check your references as to pylon usage, as the kits come with either Single or Dual rail launchers. What really sets these products apart from the others is the completeness of the package. The painting guide and extensive decal sheet puts AERO Line above the competitors in my opinion. 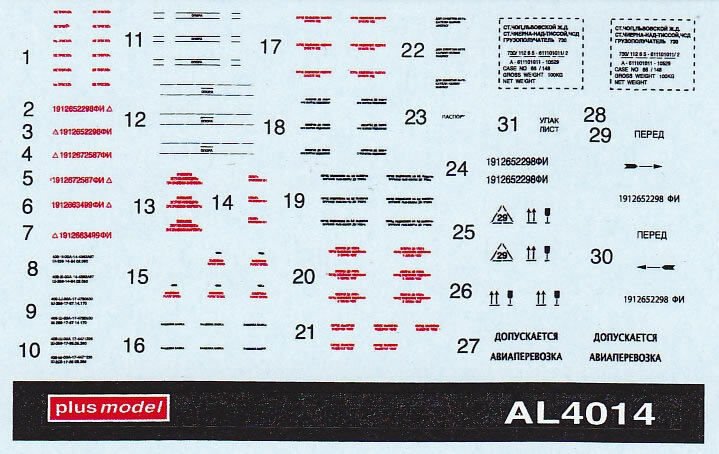 I must caveat that with the fact that I have only looked at the decals which are clear and legible (as much as they can be) however, I have not used them as yet so the above comment only covers their looks. All told, AERO Line has produced three great products here. 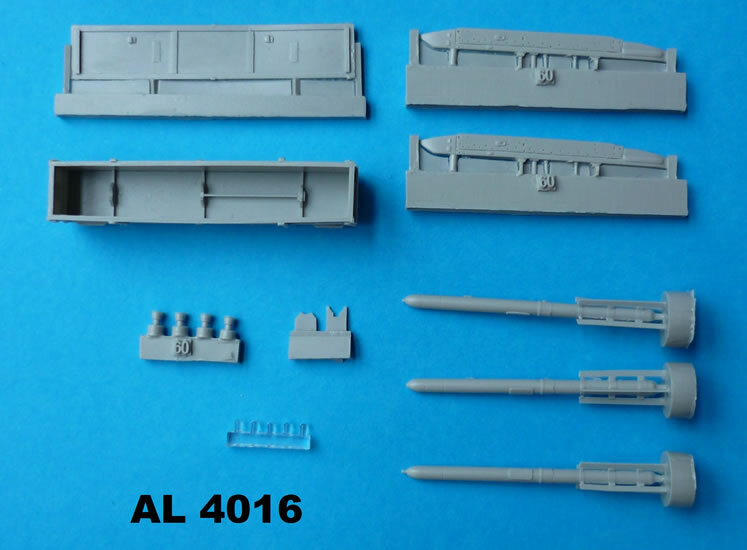 I see they also have an AA-11 Archer, I do hope that they will also do the same with the AA-10 Alamo and AA-12 Adder missiles in the future.